An intersting read from one of our planners dustin aka 'the ginger zuckerberg.' Here's our Leo Burnett Toronto take on Google +. The web has been set a blaze with Google+, the search giants’ latest attempt to infuse a social DNA into all of the company’s products. With a few false starts – Google Buzz and Google Wave certainly failed to resonate with users – this latest venture may have hit the right social cord. Google+ Stream and Sparks – Stream is quite similar to the Facebooks’ newsfeed, aiming to provide a continuous scroll of personalized content from your connections. Combined with what they call Sparks, Google+ also provides content from all over the web that’s driven from your own personal interests. Google+ Huddle - Much like the popular group messaging app Beluga, Huddle allows you to have rich conversations with many people in one simple conversation…great for getting a group of people on the same page quickly. Overall, Google+ is about 90% similar to Facebook – with one big, harry audacious implication for brands. The opportunity for brands to engage is forthcoming, in fact a few have already tried to jump the gun to the chagrin of Google. In a YouTube post last week, a Google+ product manager urges businesses to be patient, and that a unique experience for businesses is forthcoming. Although this feature will not be ready till ‘later this year, businesses can apply to be part of an early Beta test group. Despite consumer insight being hailed as the 21st Century solution and savior to effective marketing, insight – however one defines that - continues to be the poor step child to ‘humanless’ business and brand strategy, innovation and marketing. Observation 1: Insight is applied too late to effect meaningful change. Insight is often relegated to communications within the value chain and rarely brought to bear upfront at the business strategy stage. Insight into people, behavior and cultural fuels are arguably the best market lead and lag indicators for assessing forward looking business strategy: future growth opportunities and asset requirements or asset consolidation. Why? Insights are observable, measurable and concrete demonstrations of emergent or shifting human behavior, which explicitly impact market dynamics like demand. Identifying and applying insights at the communications stage may enhance a brands ability to connect in the short term, but misses the larger opportunity for a brand to create dominance (SOM, Equity, Competitive Barriers) in emerging or mature market spaces. Given the plethora of choice across most if not all categories, strategy development without the human factor seems like a big mistake. The continuing challenge for brands today is to respond with relevance or as Jez Frampton, Global CEO of Interbrand would say “risk detachment.” Increasing relevance means placing human insight at the front, not back end, of the value chain. Observation 2 : Insight is often left out of innovation. Depending on the definition of failure, 80-95 % of all new products fail. Although staggering as a percent, not surprising when you walk down the aisle of a grocery or department store. Who would buy that you ask? Good question. All too often communications, not innovation, is tasked with finding the all-powerful target market insight to drive sales, frequency, penetration and share-of-market. That is, products are developed and brought to market simply because a company can rather than should. Can because they have the production capacity and ability to do so vs. should because the innovation is based upon an insight into people, behavior and cultural fuels that embed the product itself with attributes and benefits known to deliver against an existing or unmet need or desire. Many mature categories continue to deliver growth by placing insight at the center of innovation. Yes they restructured financially, yes they divested assets, but Ford is a shining example of insight in innovation: "Even in the most tough economic times, Mulally (CEO) remarked to Smith, we are there with a new product that people really want and they value.” And they are the only big automotive without the need for bailout money. When the dominant context for brands today is creativity, innovation and imagination, insight driven strategy can be a brands biggest competitive advantage. Can Science Change The World? Google certainly thinks so, and they have elicited the help of some like-minded organizations to find the next Rock Star of science. Last week, Google launched The Google Global Science Fair, asking budding young scientist from around the world to submit interesting, creative projects that are relevant to the world today. Increasingly, more and more theories, buzz words and approaches to brand strategy are being created as a means of differentiation, attraction and salesmanship by companies in the marketplace. And similarly, this very same dynamic is flourishing within client cultures and manifesting itself in conversations awash with buzz words and vogue terms. The unfortunate offspring of this dynamic both externally and internally has become a far greater degree of valueless complexity, lack of clarity and uncertain direction. What needs to be discussed with far more courage and tenacity around any given table is the fundamental purpose of strategy. 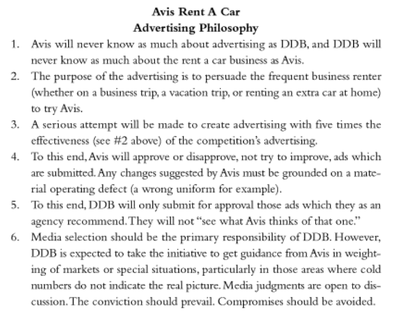 Three simple thoughts i find useful in setting up, evaluating and questioning strategy in broadest level are these: think of them as a master check list applicable to any and all brands and categories. strategy is about making choices and not compromise. it is the very practice and application of distillation: going wide in thought, analysis and creativity, then making firm decisions about what to keep and what to leave out. if a strategy isn't pointed and prejudiced it's likely vanilla. the more accurate, the more concise, the better the idea. strategy is about the basic values you're trying to deliver to people. if the brand can't define itself why would we expect people to define it for us. if that's the situation you find yourself in, then one must really question the validity of the brand itself. people aren't attracted to or merely need more stuff...they are however attracted to and desirous of more stuff with imbued purpose and meaning. that's the fundamental difference between a commodity and brand. strategy is about the courage to be different than your competitors. if everyone is going to the same place - saying the very same things, looking, behaving and talking alike - it causes people to choose on price. you know you're beginning the journey of 'different' if you can decrease the price elasticity of your brand in market and create differentiators of choice that super-cede the category itself. Get your check list out. i know i did today on these very same issues, and only gave a final grade of C+, but the conversation certainly got far more interesting and productive. There is no doubt that in most if not all categories, very few brands have the ability to compete and connect on the basis of functional attributes or benefits. Today, every consumer-packaged good competes within the context of the 65,000-sku store against numerous look alike, sound alike, taste alike, priced alike and functionally alike flanking brands. Minus the taste, many categories suffer the very same challenges as cpg: mass market automotive, telecom, professional services, airlines etc. And increasingly, all act, talk and look more like me-too category participants than they do actual intriguing and unique brands. What needs to be discussed far more courageously than it currently is within brand cultures is this: why do we expect to attract, interest and stimulate people’s purchase gene if we don’t offer them anything distinctive? Low attraction, interest and persuasion could be due to strategic issues that are difficult to fix: the product is bad, the product demand over stated / over estimated, the benefit not relevant or quite simply that people don’t see anything new to drive curiosity! If you accept the research suggesting that memorability and distinctiveness are key drivers of persuasion, then we’d all better start talking, doing and acting differently. Open our eyes wide to the only context that really matters - the one outside of the boardroom and copy test facility where the brand is really judged: a context that creates expectations about how a brand looks, talks and behaves well beyond the given category in which the brand competes. far more interesting than a print ad, far more experiential, far more compelling... and likely delivering the equivalent reach and frequency of a traditional buy. nicely done. An advertisement by Jung von Matt/Alster for watchmaker IWC. Bus straps have been fashioned from images of IWC’s Big Pilot’s Watch to allow bus travellers near the airport to try before they buy at Berlin, Germany. 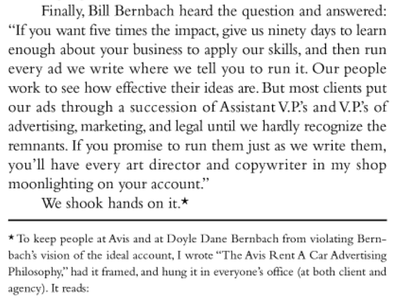 a weekend of email catch up (yes welcome to my life) lead me to this interesting and compelling work by Spring, an advertising & design agency in Vancouver, B.C. Canada. this work is simple, single minded and damn clever. it shows a very clear understanding of how a highly conceptual issue - like climate warming - can be brought to life in an intriguing way through acts not ads. rather than create a common television or print campaign starring polar bears or melting glaciers, unlike most communications, this one choose to tap into two fundamental and powerful human understandings: 1) the motivating power of self interest vs self sacrifice, and 2) experiential framing...setting the issue in a personally relevant way. Lovely work and kudo's to the client for understanding a great idea when they see one. The David Suzuki Foundation wanted to create awareness about the effects of global warming on our environment amongst Vancouverites skeptical about its authenticity. So, it enlisted Vancouver-based Spring Advertising to get them to visualize the effects on their own environment. To do that, Spring set up three-dimensional tide lines attached to city telephone poles in downtown Vancouver using a number of recycled mussel shells and fake barnacles fastened to vinyl prints. They were accompanied by street signs reading, "Global warming is closer than you think." Check out a video about the project on Spring's YouTube channel. 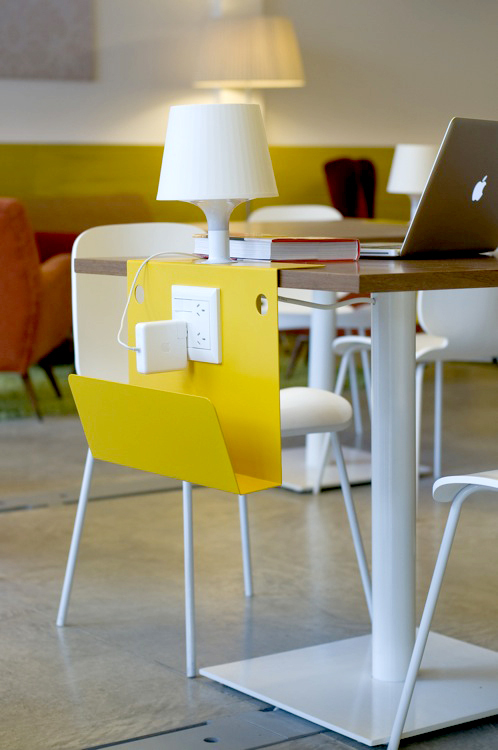 Coffee Shop-Office Hybrids: The Workplace of the Future? this is an interesting piece i stumbled upon on Fast Company - an interesting example of how a brand has tapped into a cultural fuel and behavioural understanding. read on. The digital explosion we’ve witnessed over the last 10 years may not be the result of technology itself - the internet and it’s many attendant mobile devices - but an unequivocal demonstration of pent up consumer demand resulting from fundamental shifts in behaviour. The internet and digital devices just happen to be the penultimate media which can, and has satisfied, peoples altered behavioural needs. • Where only a generation ago, our collective world view was formed within a walled garden of limited media access and selection, yet today we can globally peruse some 22,000 magazine titles across 276 verticals (specific interest areas), tune into 15,464 TV channels, and jump to any one of 5 billion websites globally. • For brands this is critical: centrally controlled editorial is extinct and real access to information and opinion exist at will: any time, any where and well beyond the control of the company, brand or marketing. • Technology has given us power… and the time of the passive consumer has past. Today, right now….people are assimilating facts, fallacies and forming perspectives on brands….our brands, and significantly shaping if not controlling the brand's narrative, image and value. • People are actively commenting on, co-creating and -re-creating brand equity through the 200 million blogs on typepad, the 4 million entries in wikipedia and 65,000 youtube posts, rants and raves that occur each and everyday worldwide. • Where only 10 years ago, people we used to call show offs, grandstanders, big mouths and braggers had but a small town stage on which to play, these same people now known as bloggers perform to a hungry and attentive worldwide audience. • This online exhibitionism has become a behavioural condition of the digital explosion to be heard, understood and passed along. • 76% of people don’t trust advertisers to tell them the truth, 64% of people trust companies less than they did a year ago and food specifically is trusted by only 55% of people. • With people saying “I can no longer rely on one source of information or what I’m being told’ the masses are turning to their peers online for the real, unmitigated scoop and perceived value found in collective wisdom: 61% of people trust others like themselves…except now those ‘others’ are not local but global ,or few but many, and connected to together anywhere and at anytime placing marketing very much in the hands of others than ourselves. • Brands can no longer push out commoditized and functional messages to a supposedly desirous and passive audience and hope to get response. • “We’re a society driven by entertainment and in an entertainment culture, everything must compete with entertainment…” which demands that all content ..even brand content, be not only ever changing and but personally interesting and created with the rules of entertainment in mind. • And of all media, it is digital's fundamental ability to provide endless, instant and timely hyper personal entertainment - inclusive of information and education presented correctly - that begins to explain increasing levels of internet penetration, time spent and astounding mobile adoption. • Digital then in essence is the one media hope that can most effectively arm current consumers with the most personally relevant tidbits to tell the best stories…. And brands whose consumers tell the best stories in the age of entertainment….win. This ‘new reality’ is markedly different than the fiction many brands continue to speak and live today - the way in which they market themselves to their respective consumer. The digital explosion is a result of an unexploited need and a fundamental shift in behaviour, which until digital remained dormant and inactive. Nike's latest spot ahead of the world cup is a 3-minute long masterpiece that lives up to the over-the-top nature of the event itself. It features many of the sport's most famous athletes along side everything from a Vegas-style show to a gigantic statue to the Queen. This film plays off the fears and aspirations inside the players of the world's game. It brings the audience into what drives the best in the world to push that little bit harder. Every play is a do or die situation and calls for everything they've got. Even amateur athletes can relate to that drive to leave it all out on the field in order to win. They may not have to worry about whether or not they'll be knighted by the queen, but they certainly have the same competitive streak that requires them to play at their best. With this spot, Nike proves they understand that insight and are committed to supporting athletes who give it their all. Imagine you're at the bar and you've set up a tab so you can drink the night away in merry bliss. Now it's 2am, you're drunk, and when you get your bill it's upwards of $73,000. That'd be a pretty powerful moment, regardless of how much you've had to drink. It's all part of a drunk driving PSA from OgilvyBrazil that aims for 'quality of reach' over 'quantity of reach'. While the scale isn't there, the people involved look like they got the message. And just think of how big a 'free media' number the PR firm will pin to this initiative once I've supported it with this post. Google has launched a new website, SearchStories, that allows people to make their own versions of Google's now infamous Parisian love ad. It's a simple yet brilliant way to get people to interact with their brand. Ben Folds has come up with a pretty cool way to use ChatRoulette during some of his recent concerts. It's going to be interesting to watch as brands start to explore this space as well. 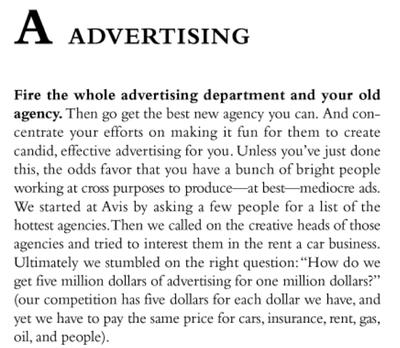 The following is an excerpt from ex-CEO Robert Townsend's new book, The Organization, where he explains how to do effective advertising. This is the same man who approved the Avis, we try harder campaign. This is a sample of our client christmas card. This year's theme was multi-purpose wrapping paper that can either be used either to wrap a loved one's gift or to be hung on the wall thanks to the inspirational message on the inside. Either way, a great gift for all. From all of us at Leo Burnett, have a very Happy Holidays. We're out now until January 4th.